The third Monday in February began as an American holiday in 1885. It’s intention was to honor our first president, George Washington. Since then, it has come to be seen as a day to honor all American Presidents. In September of 1796 as he was preparing to leave office, Washington offered to the country the counsel of “an old and affectionate friend.” He hoped that his advice might “moderate the fury of party spirit,” “warn against the mischief of foreign intrigue,” and “guard against the impostures of pretend patriotism.” Perhaps it’s time to finally take his advice. 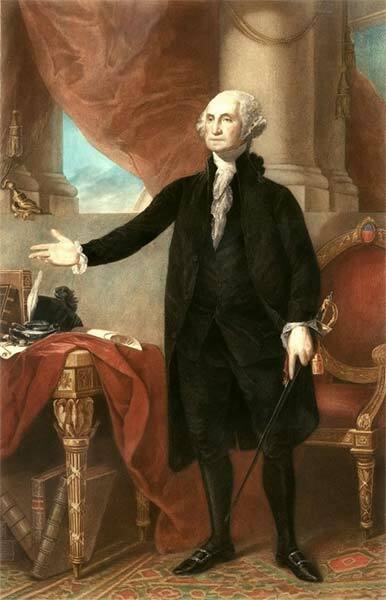 In honor of Washington, and all the following Presidents of the United States, we will be closed Monday, February 18. Your savings insured to $250,000 per account. This institution is not federally insured, and if the institution fails, the Federal Government does not guarantee that depositors will get back their money. MEMBERS ACCOUNTS ARE NOT INSURED OR GUARANTEED BY ANY GOVERNMENT OR GOVERNMENT-SPONSORED AGENCY. You are leaving www.taleriscu.org. Taleris Credit Union does not provide, and is not responsible for, the product, service, or overall website content available at a third-party site. Taleris Credit Union neither endorses the information, content, presentation, or accuracy, nor makes any warranty, express or implied, regarding any external site. Our privacy policies do not apply to linked websites. You should consult the privacy disclosures on any linked site for further information. Thank you for visiting our website. By clicking Continue, you will be directed to a site maintained by the Federal Trade Commission. You’ll notice that the location bar on your browser says: https://www.netteller.com/login2008/Authentication/Views/Login.aspx?returnUrl=%2ftaleriscu That is the official URL of our Teller 24e, and you can bookmark that page, once you are there. Using that bookmark, or typing in www.teller24e.com to your location bar, both will get you to the same place. And, don’t forget, you can bookmark our main site: www.taleriscu.org for the latest Taleris news, events and special offers. The Taleris Credit Union Nominating Committee has announced that there are a total of two (2) candidates running for two (2) open positions on the 2019 Board of Directors. Both of the candidates are incumbent (current) board members. The candidates are: James ReMalia and Louis Vocaire-Tramposch. No other candidates have submitted an application for candidacy at this time. We have posted bios of both candidates on our website at: www.taleriscu.org/election/. You can log on there to find out more about both men. Any individuals who further desire to be considered for candidacy must submit a Petition for Nomination. To obtain the petition, please call 800.828.6446 ext. 3233 or email volunteer@taleriscu.org. Once completed, mail the form to the TCU Nominating Committee • 1250 E Granger Rd • Cleveland, Ohio 44131 by November 11, 2018. You may also drop off the petition at the same address. The Taleris Nominating Committee is seeking candidates for positions on the Taleris Credit Union Board of Directors. As a director, you will be responsible for working with management, fellow board members and other volunteers in an effort to shape the future of Taleris. As a volunteer, your commitment will be approximately 4 to 6 hours per month and your input will be highly valued. General business experience is preferred and a desire to help others is a must. Nominations will be accepted through September 4, 2018. To apply, please forward your name, address and phone number to: TCU Nominating Committee, 1250 E. Granger Road, Cleveland, OH 44131. You may also hand deliver your information to the same address. If you have further questions, please call 800.828.6446 ext. 3233 or email us at: volunteer@taleriscu.org. Taleris Credit Union has added six (6) new counties to its list of areas where members are eligible to join. In addition to Cuyahoga, Lorain, Lake, Summit, Stark, Portage, Geauga and Medina counties, we now also serve members who live, work, attend school, or worship in Ashtabula, Ashland, Columbiana, Mahoning, Trumbull and Wayne Counties. We are now, truly, a credit union for all of Northeast Ohio! FOR A LIMITED TIME we’ve got personal loans at rates as low as 6.99%*. PLUS, you’ll have no payments for 60 days. So, pay off some high interest credit card debt, do some repair work around the house, or take a little vacation to someplace nice. Find out more at www.taleriscu.org/loans/ or call us at 800.828.6446 during regular business hours. *Taleris Credit Union unsecured loan promotional offer is effective as of 06/01/2018 and supersedes any and all previous Taleris Credit Union unsecured loan promotional offers. *Membership eligibility is required with a minimum deposit of $5.00 in a share/savings account. Member must be in good standing with TCU. May not be combined with any other promotion or discount. A $50.00 loan processing fee will apply. At the promotional rate of 6.99% (Platinum Credit Tier), a $2,000.00 loan with a 24 month loan term will have an Annual Percentage Rate of 9.398% APR and monthly payment of $93.72. Promotional rate available for signature loans. Promotional Signature Loan may not be used to pay down an existing TCU debt. Subject to change or cancellation without notice. For a limited time, you can open a 13-MONTH CERTIFICATE AT A RATE OF 1.75% APY*, a 17 MONTH CERTIFICATE AT A RATE OF 1.85% APY* and a 23 MONTH CERTIFICATE AT A RATE OF 2.05% APY*. This is a New Funds Promotion. ‘New funds’ means money that is not currently on deposit with Taleris, or money that has been deposited with Taleris within the last 30 days. Minimum investment is $500 per certificate. To get yours, log on to https://www.taleriscu.org/certificates, or give us a call at 800.828.6446 today. *APY = Annual Percentage Yield. 1.75% APY=1.739% Dividend Rate; 1.85% APY=1.837% Dividend Rate; 2.05% APY=2.034% Dividend Rate. All current and new members are eligible. Penalty may be imposed for early withdrawal. Change is never easy, but it is usually necessary. 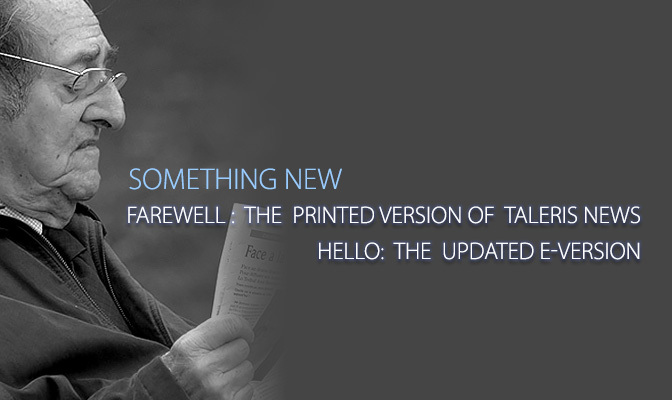 Taleris has been publishing a printed quarterly newsletter for our members for many years. But, with the rising costs of printing and postage, we have made the decision to stop production on our printed newsletter effective July 1, 2018. • A screen-friendly version that will be available on our website. • A PDF file that you can view and print if you prefer a hard copy. • As a screen reader-friendly RTF file for our members who may be visually impaired. Give these new versions a try and let us know what you think! FOR A LIMITED TIME we’ve got personal loans at rates as low as 6.99%*. PLUS, you’ll have no payments for 60 days. So, pay off some high interest credit card debt, do some repair work around the house, or take a little vacation to someplace nice. To find out more call us at 800.828.6446 or CLICK the button below. Taleris Credit Union unsecured loan promotional offer is effective as of 06/01/2018 and supersedes any and all previous Taleris Credit Union unsecured loan promotional offers. *Membership eligibility is required with a minimum deposit of $5.00 in a share/savings account. Member must be in good standing with TCU. May not be combined with any other promotion or discount. A $50.00 loan processing fee will apply. At the promotional rate of 6.99% (Platinum Credit Tier), a $2,000.00 loan with a 24 month loan term will have an Annual Percentage Rate of 9.398% APR and monthly payment of $93.72. Promotional rate available for signature loans. Promotional Signature Loan may not be used to pay down an existing TCU debt. Subject to change or cancellation without notice. Taleris Credit Union has added six (6) new counties to its list of areas where members are eligible to join. In addition to Cuyahoga, Lorain, Lake, Summit, Stark, Portage, Geauga and Medina counties, we now also serve members who live, work, attend school, or worship in Ashtabula, Ashland, Columbiana, Mahoning, Trumbull and Wayne Counties. We are now, truly, a credit union for all of Northeast Ohio! 1. A screen-friendly version that will be available on our website. 2. A PDF file that you can view and print if you prefer a hard copy. 3. A screen reader-friendly RTF file for our members who may be visually impaired. For a limited time, you can open a 13-MONTH CERTIFICATE AT A RATE OF 1.75% APY*, a 17 MONTH CERTIFICATE AT A RATE OF 1.85% APY* and a 23 MONTH CERTIFICATE AT A RATE OF 2.05% APY*. This is a New Funds Promotion. ‘New funds’ means money that is not currently on deposit with Taleris, or money that has been deposited with Taleris within the last 30 days. Minimum investment is $500 per certificate. To get yours, CLICK the button below, or give us a call at 800.828.6446 today. You are leaving www.taleriscu.org. Taleris Credit Union does not provide, and is not responsible for, the product, service, or overall website content available at a third-party site. Taleris Credit Union neither endorses the information, content, presentation, or accuracy, nor makes any warranty, express or implied, regarding any external site. Our privacy policies do not apply to linked websites. You should consult the privacy disclosures on any linked site for further information. Thank you for visiting our website. By clicking Continue, you will be directed to a site hosted by FINAID. You are leaving www.taleriscu.org. Taleris Credit Union does not provide, and is not responsible for, the product, service, or overall website content available at a third-party site. Taleris Credit Union neither endorses the information, content, presentation, or accuracy, nor makes any warranty, express or implied, regarding any external site. Our privacy policies do not apply to linked websites. You should consult the privacy disclosures on any linked site for further information. Thank you for visiting our website. By clicking Continue, you will be directed to a PDF file hosted by the Federal Trade Commission. You are leaving www.taleriscu.org. Taleris Credit Union does not provide, and is not responsible for, the product, service, or overall website content available at a third-party site. Taleris Credit Union neither endorses the information, content, presentation, or accuracy, nor makes any warranty, express or implied, regarding any external site. Our privacy policies do not apply to linked websites. You should consult the privacy disclosures on any linked site for further information. Thank you for visiting our website. By clicking Continue, you will be directed to the Best Benefits Club log in page. You are leaving www.taleriscu.org. Taleris Credit Union does not provide, and is not responsible for, the product, service, or overall website content available at a third-party site. Taleris Credit Union neither endorses the information, content, presentation, or accuracy, nor makes any warranty, express or implied, regarding any external site. Our privacy policies do not apply to linked websites. You should consult the privacy disclosures on any linked site for further information. Thank you for visiting our website. By clicking Continue, you will be directed to the Best Benefits Club registration page. You are leaving www.taleriscu.org. Taleris Credit Union does not provide, and is not responsible for, the product, service, or overall website content available at a third-party site. Taleris Credit Union neither endorses the information, content, presentation, or accuracy, nor makes any warranty, express or implied, regarding any external site. Our privacy policies do not apply to linked websites. You should consult the privacy disclosures on any linked site for further information. Thank you for visiting our website. By clicking Continue, you will be directed to the CoOp Shared Branch / ATM Finder. You are leaving www.taleriscu.org. Taleris Credit Union does not provide, and is not responsible for, the product, service, or overall website content available at a third-party site. Taleris Credit Union neither endorses the information, content, presentation, or accuracy, nor makes any warranty, express or implied, regarding any external site. Our privacy policies do not apply to linked websites. You should consult the privacy disclosures on any linked site for further information. Thank you for visiting our website. By clicking Continue, you will be directed to the CoOp ATM Finder. You are leaving www.taleriscu.org. 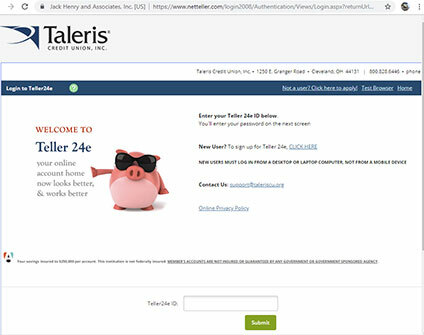 Taleris Credit Union does not provide, and is not responsible for, the product, service, or overall website content available at a third-party site. Taleris Credit Union neither endorses the information, content, presentation, or accuracy, nor makes any warranty, express or implied, regarding any external site. Our privacy policies do not apply to linked websites. You should consult the privacy disclosures on any linked site for further information. Thank you for visiting our website. By clicking Continue, you will be directed to our first mortgage partner, Woodside Mortgage. You are leaving www.taleriscu.org. Taleris Credit Union does not provide, and is not responsible for, the product, service, or overall website content available at a third-party site. Taleris Credit Union neither endorses the information, content, presentation, or accuracy, nor makes any warranty, express or implied, regarding any external site. Our privacy policies do not apply to linked websites. You should consult the privacy disclosures on any linked site for further information. Thank you for visiting our website. By clicking Continue, you will be directed to Visa Consumer Security. You are leaving www.taleriscu.org. Taleris Credit Union does not provide, and is not responsible for, the product, service, or overall website content available at a third-party site. Taleris Credit Union neither endorses the information, content, presentation, or accuracy, nor makes any warranty, express or implied, regarding any external site. Our privacy policies do not apply to linked websites. You should consult the privacy disclosures on any linked site for further information. Thank you for visiting our website. By clicking Continue, you will be directed to Verified by Visa. You are leaving www.taleriscu.org. Taleris Credit Union does not provide, and is not responsible for, the product, service, or overall website content available at a third-party site. Taleris Credit Union neither endorses the information, content, presentation, or accuracy, nor makes any warranty, express or implied, regarding any external site. Our privacy policies do not apply to linked websites. You should consult the privacy disclosures on any linked site for further information. Thank you for visiting our website. By clicking Continue, you will be directed to Elan Card Services, our Visa Account partner. You are leaving www.taleriscu.org. Taleris Credit Union does not provide, and is not responsible for, the product, service, or overall website content available at a third-party site. Taleris Credit Union neither endorses the information, content, presentation, or accuracy, nor makes any warranty, express or implied, regarding any external site. Our privacy policies do not apply to linked websites. You should consult the privacy disclosures on any linked site for further information. Thank you for visiting our website. By clicking Continue, you will be directed to Yahoo Finance.